hamzaafzal wrote: How much time will it take? From NOW, it will take more than 6 month; expected in March-2017. You shouldn't expect much. Looks like PIA will be spending bail out money to pay loans in order to get more loans in future. This is how state of Pakistan is being run and this is how state-owned companies will be run. According to a report in March 2 edition of English daily 'Business Recorder', the process to change seats of PIA Boeing 777 aircraft will start in November, five out of nine aircraft will be sent to Singapore for the change of seats that will cost US$ 42 million. Installation of new seats probably to be performed by Singapore-based JAMCO Aero Design & Engineering (JADE) - jamco-jade.com. Pakistan International Airlines (PIA) is seeking Supplemental Type Certificate (STC)/Integrator/Maintenance, Repair and Overhaul (MRO) for retrofit and installation of seats/In-flight entertainment (IFE) on its Boeing 777 fleet as PIA is upgrading its Business Class with new messrs Stelia Solstys seats (proposed layout of passenger accommodation - LOPA for new Business Class will be provided with tender documents) vis-a-vis PIAC is also upgrading its existing Panasonic 3000/3000i IFE system with eXK to provide Business Class with eX3 experience and X-series type IFE system experience for S3Ki premium Economy Class and Economy Class (seats in Economy Class will remain same). Retrofit proposal from Federal Aviation Administration (FAA)/European Aviation Safety Agency (EASA) approved design organisations, having experience in similar type of projects on Boeing 777 aircraft, are required for performing Business Class upgradation and IFE upgrade (eXK) on nine PIA Boeing 777 aircraft (four Boeing 777-200ER, two Boeing 777-200LR and three Boeing 777-300ER). * FAA STC offering will be preferred for mentioned upgrade. * First prototype needed to be modified at integrator/design organisation's own facility. c) Completion services at MRO facility. Singapore-based JAMCO Aero Design & Engineering (JADE) - jamco-jade.com - declared as successful bidder. make pia into an all economy airline and improve your economy product, people who can afford club class tickets do not travel on pia. Exactly, all the business travelers, including expat living in Pakistan choose ME3 for their business flights abroad. I worked for a company where most of directors and MD were expats. After they were not satisfied with PIA's safety, it was decided that for coming from Karachi to Lahore, the MD would first travel via Emirates to Dubai and then catch Dubai to Lahore flight. Such is the trust. In my opinion, the airline needs to work on its perception than seats, cabins, food and IFE. Maybe after the end of Hajj 2017 flights operation, PIA Boeing 777s will start getting equipped with new seats. Last edited by Abbas Ali on Thu May 11, 2017 11:10 am, edited 1 time in total. PIA Boeing 777 Business and Economy Class cabins will be upgraded with new seats and in-flight entertainment systems at a cost of five billion rupees. Business Class cabins will be equipped with flat-bed seats. Heard this will happen this November. "A mile of highway will take you a mile. A mile of runway will take you anywhere." 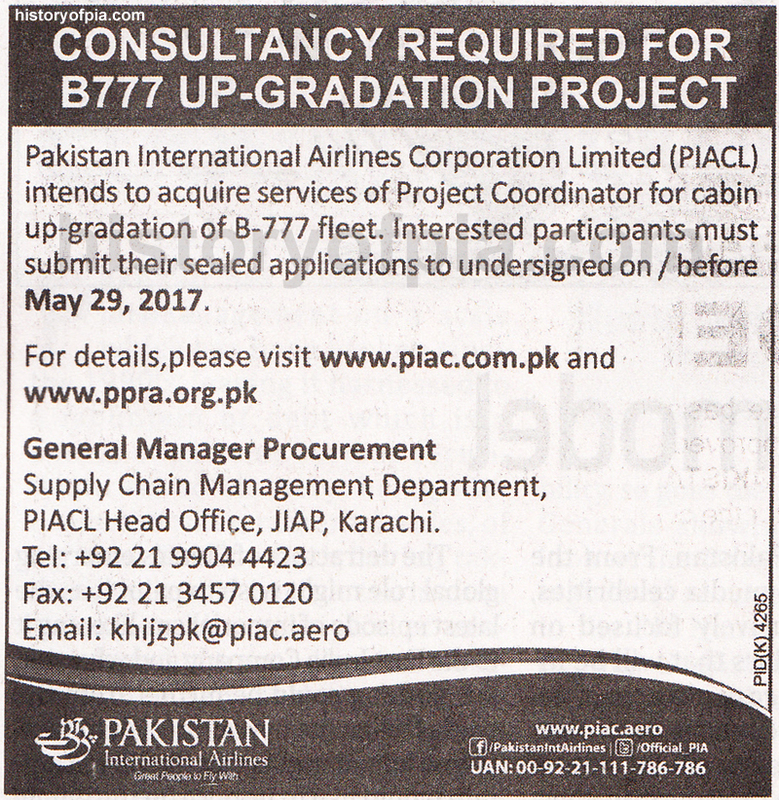 Pakistan International Airlines Corporation Limited (PIACL) intends to acquire services of Project Coordinator for cabin up-gradation of Boeing 777 fleet. My Nephew was on PK 782 last night from YYZ to ISB and informed me that his LCD was cracked. The aircraft still had the old Recaro seats (economy) in a bad shape. 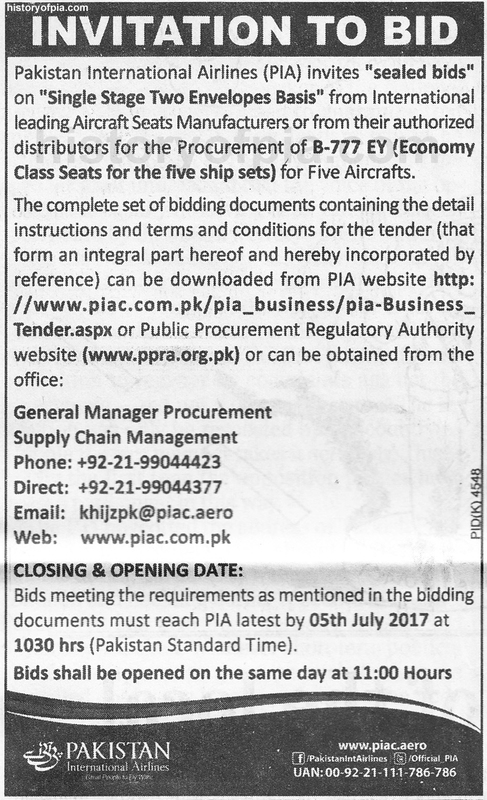 Pakistan International Airlines (PIA) invites sealed bids on single stage two envelopes basis from international leading aircraft seats manufacturers or from their authorized distributors for the procurement of Boeing 777 EY (Economy Class seats for the five ship sets) for five aircraft. From bidding document seems Economy Class seats are required for three Boeing 777-200ER (AP-BGJ, AP-BGK & AP-BGL) and two PIA Boeing 777-200LR (AP-BGY & AP-BGZ) aircraft. * Seats must be approved for installation on Boeing 777-200ER and Boeing 777-200LR. * Seats must be compliant with the latest FAR25/CS-25 requirements (including 25,562) that include 16G certification and complies with RTCA/DO-160D for electrical items. * Seat manufacturer must be TSO holder, must be compliant with C127a. The TSO must cover whole seat structure including fire, static and dynamic tests. If any seat feature is not covered in TSO or fire, static and dynamic tests then it must be approved through FAA process and is eligible to be installed on Boeing 777-200ER and Boeing 777-200LR. * 3-4-3 abreast configuration, front seat row will be 3-3-3 abreast in each zone. * To be certified with Panasonic eXLite ECO 12 inches (V3) LCDs (preferred) or ECO 11 inches LCDs with PED Power Module™ one per passenger. * Seat cushions must be less weight, better ventilation and high density, durable to ultraviolet rays and designed to provide lumbar support. Foam hardness should be well enough to avoid sinking of body. * Provisioning installation for standard belts on all passengers (standard belts are SFE). * All maintenance documents including manuals, SBs etc. must be provided by manufacturer throughout the life cycle of seats in both digital and hard copy format. * Seat manufacturer will be required to provide product support in all necessary spare parts as long as at least one aircraft in service irrespective of any obsolescence. * Transparent pouch for life vest (preferably Air Cruiser P/N 66601-101) stowage with tamper evident seals at the seat bottom. * For ease of stretcher installation, the seat backrest must be provided with quick release break over device for seats specified for stretcher installation. IS PK moving to 3-4-3 seating ad mentioned in the tender document?